We arrived home in the early afternoon, glad to find the house still in working order and surprisingly clean. I had expected lots of dust, but apparently this place is tight because it looks as good as it did the day we left. Just wish I could say the same for the yard! The highlighted yellow lines on this map display our journey of 7,000 miles, which included 22 diesel fuel fill-ups, sightings of 1 bear, 1 moose, 3 foxes, a few beavers, and millions of birds. We shot 224 video clips and over 2500 photographs, destroyed three maps, and spent too much $! Keep in mind that Newfoundland is reduced to fit this map page. 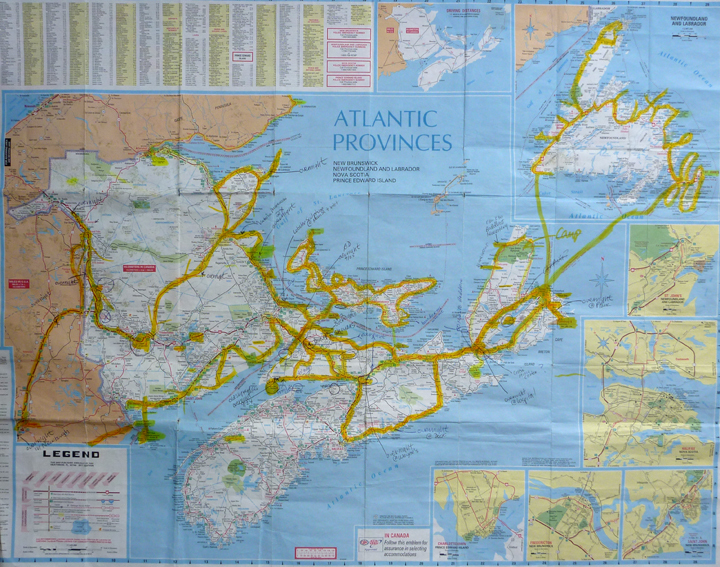 At 111,390 sq km, it is approximately equal to the total area of the other Maritime Provinces (Nova Scotia, New Brunswick and Prince Edward Island) combined. Taking everything into account, spending three months in a rolling tin can provided an extremely gratifying experience. I hope you enjoyed my blog posts. Stay tuned for future adventures! thanks for sharing a wonderful journey! Great blog. Glad you got home okay. I’ve been watching your blog since you left here. Cue me up for your next adventure, so I can keep track of you. Nice work. Thanks Larry, glad you enjoyed my ramblings. Use the “follow” button in lower right corner and you will automatically get each posting I add to the blog. Not yet sure when our next journey will begin. Home is good too…………….that was quite a trip!! !